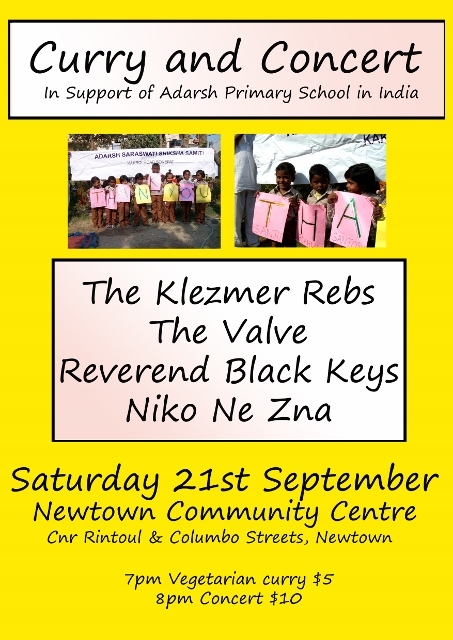 Curry, Rebs, the Valve, Rev Black Keys and Niko Ne Zna this Saturday 21 September from 7pm at Newtown Community Centre! For a great cause – fundraiser for Adarsh Primary School in India. Curry ($5) from 7pm followed by 4 bands just $10! Come join the Rebs for our short set at 8pm and stay on for the Valve, the Rev, and the Balkan brass mania of Niko Ne Zna! Eat, listen, dance. What’s not to like? Klezmer music has its roots in the Ashkenazic Jewish communities of Eastern Europe, who brought its lively melodies to the United States where they melded with new influences like jazz and swing. The sound of Klezmer has since migrated around the world, and a tight-knit band of musicians continues to keep the sound alive in New Zealand. Sam Wicks investigates the enduring appeal of the original shtetl (ghetto) music. The programme features interviews with Rebs singer/trumpeteer Dave Moskovitz and mandolin/guitarist David Weinstein, along with Jews Bro Hershel Hersher.